This watch gets its DNA from the hugely popular Sinn EZM 3 but adds a chronograph function using Sinn's SZ02 calibre. The design similarities are quite clear when viewing the hands, dial, markers and diver's bezel. 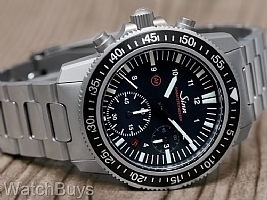 The Sinn EZM 13 features a 41.5 mm bead blasted case in 316 L stainless steel with left mounted controls. The Sinn EZM 13 is the all-new diving chronograph from Sinn, and features the in-house modified SZ02 movement with 60-minute register. With 500 meters of water resistance, the Sinn EZM 13 has been tested to European diving equipment standards and certified by DNV GL, and is Mission Timer certified for optimal readability and use with crown and chronograph pushers relocated to the left side of the case. 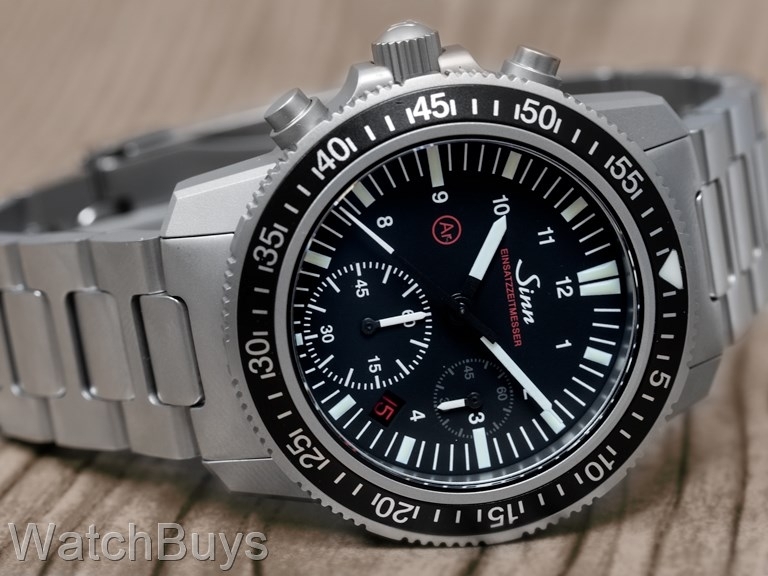 When we spoke to Sinn's CEO Lothar Schmidt he indicated that this chronograph had been engineered to allow the use of the chronograph pushers underwater. Sinn is known for their professional special forces watches, called the Einsatzzeitmesser (EZM - in English "Mission Timer") series. Sinn has long been a supplier of watches to various divisions of the German special forces, including the GSG-9, border protection, customs, military and special police divisions. Designing watches for these units carries a number of requirements, including resistance to shocks, water, magnetism and temperature changes among others. There is also a functional requirement in that the watch must be highly legible and the controls must be both accessible and easy to use in extreme environments. This watch takes its place in the Mission Timer Series as the new Sinn EZM 13, and you'll notice that the crown and pushers have been relocated to the left side of the case as is typical for EZM watches. What's inside this watch also shows how Sinn engineers watches. The Sinn modified SZ02 calibre consists of a redesigned minute register which actually counts 60 minutes rather than the typical 30. This register has been enlarged and is placed at the 6 position. This case offers magnetic field protection of up to 80,000 A/m, among the highest for any mechanical watch. Magnetism can cause dramatic swings in the timekeeping of a mechanical watch movement. People are often exposed to magnetic fields without even knowing so – frequent high altitude flying, metal detectors, audio and video equipment, medical equipment and computer equipment to name a few. Mechanical watches require oils to ensure proper operation, and the proper care of any mechanical watch movement mandates that these oils maintain both their viscosity and lubrication properties. Sinn has found that filling the case with inert gas can help prevent the introduction of moisture and humidity to the case, as well as provide a more stable environment for the oils that lubricate the movement. This inert gas mixture, signified by the Ar symbol on the dial, is used to fill the watch case prior to being sealed. This will prevent air from entering the watch case, which will promote a dry and stable environment, but also prevents the dial and crystal from fogging. The second aspect of this technology is a dehumidifying copper sulfate capsule that absorbs unavoidable diffused atmospheric moisture within the watch, thus slowing down the aging process of the movement inside. A second advantage is that any condensation that were to develop does not appear underneath the crystal, even in very humid weather conditions. The dehumidifying capsule turns various shades of blue according to its degree of saturation, displayed through a small sapphire crystal window. Screw-down crown. Crown and chronograph pushers are sealed and protected by a specific material used in chemical vacuum technology. Matte finish stainless steel case with solid case back. Stainless steel bracelet. Sapphire crystal with luminous hands and hour markers. Watch is water resistant to 500 meters and is suitable for diving. We welcome the new Sinn EZM 13 to Sinn's collection of Mission Timers. We know that this watch will be in high demand for some time, just as the Sinn EZM 3 continues to be one of the most popular Sinn watches more than a decade after its initial introduction. "A Tool Watch among tool watches." Verified Owner Comments: One watch guy here. My mkii milsub lrrp is retired after 8 years of very hard use-hundreds of search warrants, and bad stuff that goes with that. It never really came off my wrist. Now I have my next one watch. EZm13 and wow. It was delivered on time, in record time, and being my first watch, watchbuys foot the bill for the 25$ shipping to get it to me on a saturday, when I asked about getting it before I left for a week. Watch buys came through with their great service I read about here and on the sinn forum. I must say this watch is gorgeous. Its unique and tough and not common-and the bracelet is so easy to manage. I am very pleased with my purchase. Its a lot of money but well worth it. Another plus-the watch was timed exactly when it arrived. No need to adjust it. Verified Owner Comments: As a Boeing 767 pilot and avid SCUBA diver I currently own over 20 dive/pilot style watches. I have been thinking of purchasing a Sinn watch for several years now and finally decided to pull the trigger and buy the EZM 13. I have been wearing my EZM 13 for a few weeks now and love it. The style and quality of Sinn is as good if not better than all of my big Swiss brand watches. The guys at Watchbuys were extremely fast to respond to questions and to ship the watch. I highly recommend Sinn and Watchbuys.